Chevy pro Bryan Thrift caught 5 bass weighing 13 pounds, 15 ounces to win $125,000 at the Walmart FLW Tour on Beaver Lake with a four-day catch of 54-8. ROGERS, Ark. (March 6, 2011) – Chevy pro Bryan Thrift of Shelby, N.C., caught a five-bass limit weighing 13 pounds, 15 ounces Sunday to win $125,000 at the Walmart FLW Tour presented by Straight Talk on Beaver Lake with a four-day catch of 18 bass weighing 54-8. “I don’t want to slow down,” said Thrift, who is the reigning Walmart FLW Tour Angler of the Year and has posted seven top-10 finishes and two wins in the last eight events dating back to the 2009 Forrest Wood Cup. “I want to catch them everywhere I go. That’s my goal. That 12-inch fish was the only cull of the day for Thrift on Sunday, as he caught only six keepers on the last day of competition. Thrift said he began the tournament catching fish on a translucent jerkbait with a blue back around timber on points and was having some success, but was tipped off by fellow North Carolina competitor Matt Arey that the fish seemed to prefer a fast retrieve, which bucks the notion that jerkbaits should be slowed down in colder water temperatures. “I took it down the lake the third day to where I’d been catching them,” Thrift said. “I was in 4 feet of water jerking the jerkbait just as hard as I could jerk it and they were knocking the paint off of it. It was ridiculous. Thrift said he changed the stock jerkbait hooks to larger hooks that would make the bait sink slowly. He said he would twitch the bait up to a tree and then dead-stick it and let the bait fall by the tree for 20 to 30 seconds (15 to 20 feet) before the strike would come. Thrift said this method produced eight bass from one cedar tree. Thrift’s winning setup consisted of a 6-foot, 6-inch Damiki Dark Angel medium-heavy rod, a rod Thrift called “hands-down the best jerkbait rod” he’s ever thrown. Thrift relied on an Abu Garcia Revo reel and 10-pound Berkley Trilene 100% Fluorocarbon to finish out his rig. Thrift said he also caught two of his weigh fish during the tournament on a bluegill-colored Damiki DC-200 crankbait. Thrift opened the tournament in 36th place Thursday with three bass weighing 8-11. 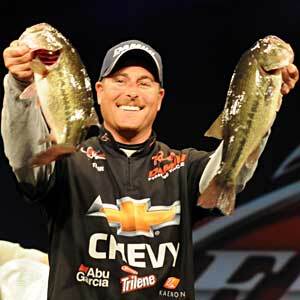 On Friday he added another five bass weighing 11-6 to move to 16th place. He then caught five bass weighing 20-8 Saturday to make the crucial top-10 cut in second place. The catch gave Thrift the win by a 2-pound, 2-ounce margin over Stacey King of Reeds Spring, Mo., who caught a total of 19 bass weighing 52-6 and earned $35,000. King said his baits were shad colored with the exception of a green craw Wiggle Wart. King said his Wiggle Wart fish were scattered on steep banks and in creeks and his other fish were found on steep secondary points in coves that featured cedar trees. Overall there were 44 bass weighing 105 pounds, 15 ounces caught by pros Sunday. The catch included seven five-bass limits.